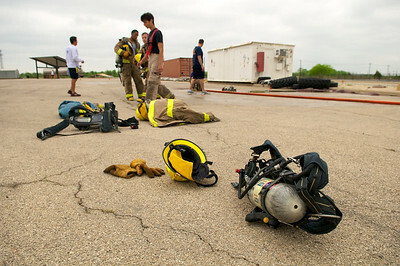 Students from the LBJ High School Fire Academy take part in a drill at the Austin Fire Department’s training facility. 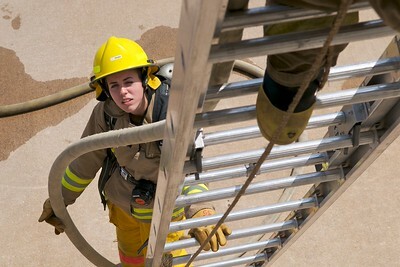 A participant in the program holds the ladder for her friend during a training drill with the LBJ High School Fire Academy. 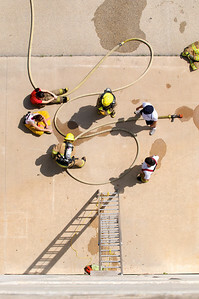 Two participants help organize the hoses on top of a fire truck used during a training exercise for the LBJ High School Fire Academy. 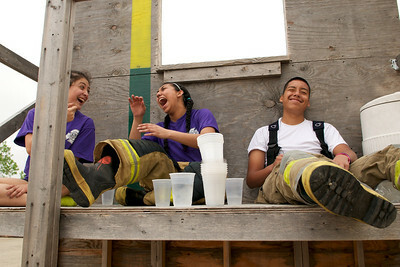 Three participants in the LBJ High School Fire Academy joke around during a break in their training. 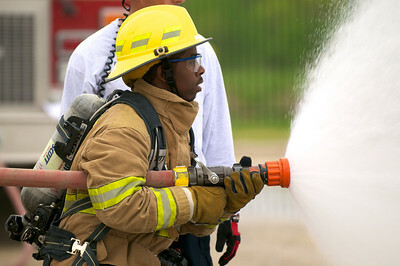 A participant in the LBJ High School Fire Academy practices using a fire hose during a drill. Two participants run through a skills assessment on using the oxygen masks during their class time at the LBJ High School Fire Academy. 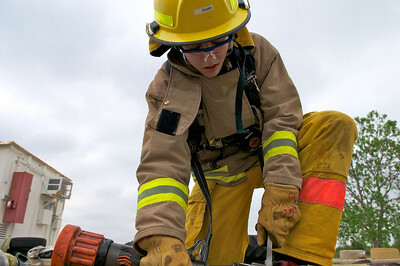 A junior in the LBJ High School Fire Academy arm wrestles a senior participant in the program during their lunch break on a training day at the Austin Fire Department’s training facility. 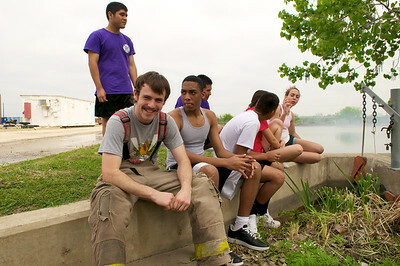 Participants in the LBJ High School Fire Academy rest during a break in a training day. 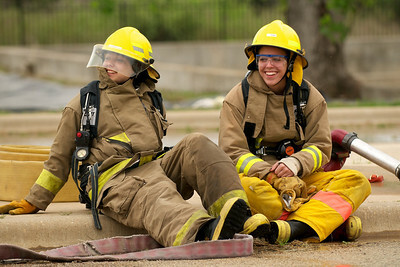 Some students, such as the one in front of this photo, plan on pursuing a firefighter career after graduation from high school. 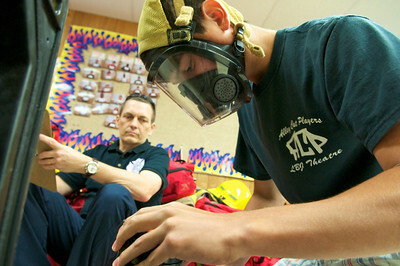 A student completes a skills assessment task as an instructor looks on during their class time at the LBJ High School Fire Academy. 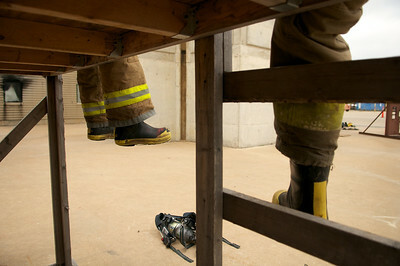 The students at the LBJ High School Fire Academy run through drills using the same gear as regular firefighter recruits. 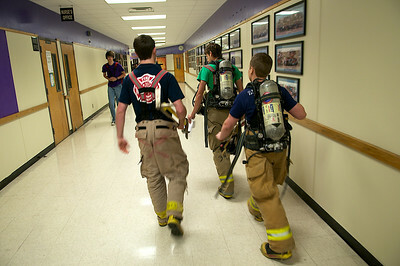 Three students in the LBJ High School Fire Academy walk through the halls on their way to visit a class and to recruit for next year’s program. 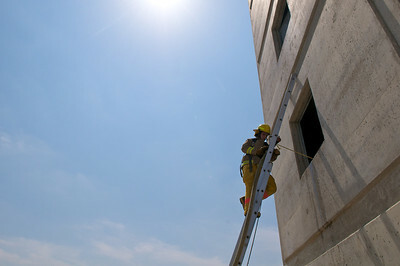 A student in the LBJ High School Fire Academy runs through a drill during a training day at the Austin Fire Department’s training facility. 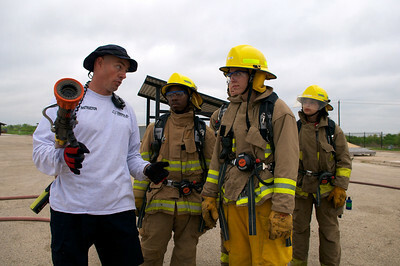 March 26, 2011 - LBJ Fire Academy field day at the Austin Fire Department training facility.